Sudan's government is set to release opposition Islamist leader Hassan al-Turabi from jail, his son says. Sediq al-Turabi said officials had told him his father would be released soon, although they did not indicate when. He is currently in hospital after going on hunger-strike to protest at being detained without charge since March. The news follows the release of seven senior members of Mr Turabi's Popular National Congress, who had been accused of plotting a coup. Mr Turabi has denied his party was involved in any plot. But he has criticised the government's policy in Darfur, where some one million people have fled their homes, in what human rights groups say is a genocide by Arab militias against black Africans. 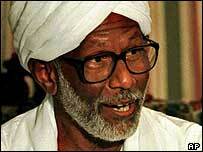 Mr Turabi is a former ally of President Omar al-Bashir, who came to power in an Islamist-backed coup in 1989. He was previously detained in 2001 after a power struggle with Mr Bashir - and was released from house arrest in October last year.